It’s a 15 hour drive to New Orleans (where my brother and his wife live) from our home in Virginia, so I knew I’d need to make a stop with the kids along the way and Chattanooga, TN was one of our stops (we also stopped in Pigeon Forge). The last time I was in Chattanooga was in 1998 and I was eager to go back to explore with the kids. Chattanooga is a great place to visit, particularly if you have just a weekend. We stayed at The Chattanoogan, which is a Chattanooga hotel that’s situated in a delightfully quiet part of town. There is free covered parking at the hotel (a bonus on hot summer days) and it was easy to get in and out as we got acquainted with Chattanooga. While I enjoy staying “in-town,” many times you need to just abandon your car for a few days, so it was nice to be able to access the minivan with ease. The Chattanoogan offers free high-speed Wi-Fi throughout the hotel, including in the guest rooms, which was nice and not available at every hotel (and it really was high-speed). There are also several on-site restaurants at this Chattanooga hotel near Lookout Mountain, including the Broad Street Grille and Stroud’s Sidewalk Café, which is perfect when you have hungry kids that want to eat as soon as possible. 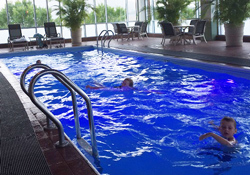 One of our first stops inside The Chattanoogan was the heated indoor pool. It was a small pool, but it was just the right size for my four kids. Even better, there are scenic views of Lookout Mountain. And, as the sun goes down and it begins to get dark, lights in the pool change the water color to neon blue. We had connecting rooms at the hotel: one room with a king bed for me and one room with two queen beds for the kids. This was pure heaven after spending two nights in one room with two queens and a rollaway bed. Not every hotel offers connecting rooms (usually just adjoining), so it was helpful to be able to keep the door open between the two rooms to keep tabs on my kids. 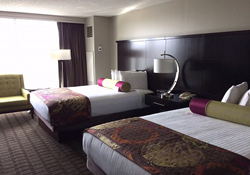 My kids loved their two queen beds at The Chattanoogan. I loved that we had connecting rooms. The Chattanoogan is within easy walking distance of a number of attractions, like the Tennessee Aquarium and the Coker Tire Museum, as well as shops and restaurants in downtown Chattanooga. If you go to Chattanooga and stay at an in-town Chattanooga hotel, here are a few of my top picks with kids. Rock City. Situated atop Lookout Mountain, walk along a 4,100-foot walking trail at Rock City to see various rock formations before taking in panoramic views that enable you to see seven states. Stay for lunch at Café 7, which sits atop the mountain at Lover’s Leap. Coolidge Park Carousel. It’s a must to ride the Coolidge Park Carousel, a fixture at the park for more than 100 years. With more than 52 hand-carved animals and a calliope organ playing music as the carousel turns, you and your kids will love this old-fashioned experience. Ruby Falls. One of the must-sees in Chattanooga is actually several hundred feet below ground. 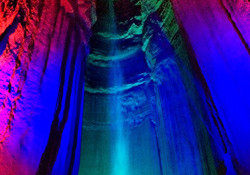 Your kids will love exploring the caverns at Ruby Falls before taking in the 145-foot underground waterfall. Try one of the popular lantern tours, which are only offered on Friday evenings. Incline Railway. To get to the top of Lookout Mountain, hop aboard the Incline Railway. 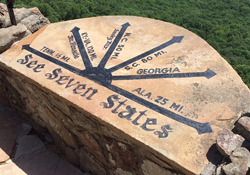 Enjoy the views from the trolley-style car as you make your way up the mile-long rail to Lookout Mountain Station, the highest overlook on the mountain. Southern Belle. 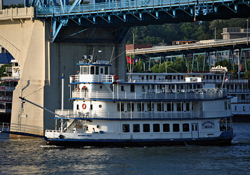 Take a cruise along the scenic Tennessee River on board the Southern Belle. 90-minute cruises depart daily, offering views of the Chattanooga skyline and Lookout Mountain as you listen to narration about the history and sights of this southern town. Tennessee Aquarium. Visit with otters, watch an IMAX movie, meet the macaws and hear from one of the keepers on the secret lives of penguins at the Tennessee Aquarium. There are a number of delicious places to eat in Chattanooga that are perfect for kids and families. Broad Street Grille. Located inside The Chattanoogan, the food at Broad Street Grille is delicious. For dinner, I ordered the Shrimp and Grits, which was incredible. Even better, we had waiter who liked to make specialty kiddie cocktails. He definitely earned bonus points with my kids. Champy’s. 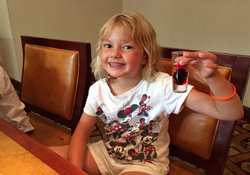 Everyone, and especially my friend Lori at Expedition Mom, talks about and lovesChampy’s. It’s basically a fried chicken joint, but the plates are big, the atmosphere is casual and the service is quick, everything I look for in a kid-friendly restaurant. Purple Daisy Picnic Café. If you’re looking for tasty barbecue – pulled pork sandwiches, rib baskets, baked beans – then you want to go to Purple Daisy Picnic Café. The food is well-priced and tasty, the decorations are fun and the wait staff is friendly. Be sure to try the Alabama Dirt. Yum. Clumpies. After dinner, head to Clumpies (yes, there’s both a Champy’s and a Clumpies in Chattanooga) for ice cream cones. Clumpies boasts handmade ice cream in both traditional flavors, like Chocolate and Butter Pecan, as well as less traditional flavors, like Firecracker (which is made with Pop Rocks).